In an effort to push a false sense of gender equality, Procter & Gamble makes the claim in a 2017 ad: “Households don’t care who head them.” Well, ad agencies may affirm that, but reality doesn’t. Those in poverty care. According to the US Census Bureau, only 5.6 percent of households with intact families (married mother and father) are below the poverty line. Among householders headed by a single father, 13.1 percent are below the poverty line. Single-mother led homes are five times more likely to be in poverty than intact married homes and twice as likely as single-father households, with 26.6 percent below the poverty line. In a #TalkAboutBias ad P&G created to talk about race, it showed its own bias. In an ad where “black parents are discussing racism with their children over several decades,” fathers are only seen, not heard. It’s a world where men, apparently, have nothing to offer. In a day and age when social justice warriors talk about the marginalized, they marginalize. When progressives talk about ending abuse, they abuse. When corporations give lip service to “equality,” they often—like P&G—fund the most violent form of inequality. 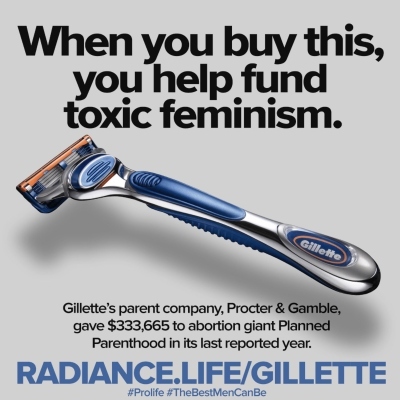 So, Gillette, #TheBestMenCanBe is far beyond your political hashtag. Can some men do better? Absolutely. Can some women do better? Absolutely. There are many men who protect the vulnerable, who teach their children that bullying is for the weak, who treat women with respect, who impart integrity and spiritual character, and don’t fit the stereotype you’re foisting onto all men. There are things more toxic than (leftist) societal perceptions of acceptable “masculinity.” And we see it in the nearly 1 million killed a year by an industry supported by your donations. Or, does that truth cut like a razor? Previous Will Americans One Day Look Back in Disbelief That It Was Legal to Kill the Unborn As We Do Slavery? Next Do Black Christians Undermine Their Values When They Vote for Liberals? The ultimate chaos is when men and women consider each other enemies. The Left thrives on chaos; it’s the deconstruction that precedes the reconstruction of the Socialist order. It’s so obvious and yet so few seem to get it. Excellent article, as usual by Ryan: educational, realistic, inspirational. Thank you Ryan. If Feminists really believe that men are so bad, why aren’t they pushing for abstinence instead of abortion? Why aren’t they simply leaving men alone instead of sleeping with them? Are they lying about men and know it, or do they truly believe that men are that evil but are too stupid to keep away from them? Which is it? The pro-abortion movement seems to be a bunch of women bragging about their lack of self-control.